This journey starts at home, and choosing such a starting point is just an excuse to talk about my plans here. 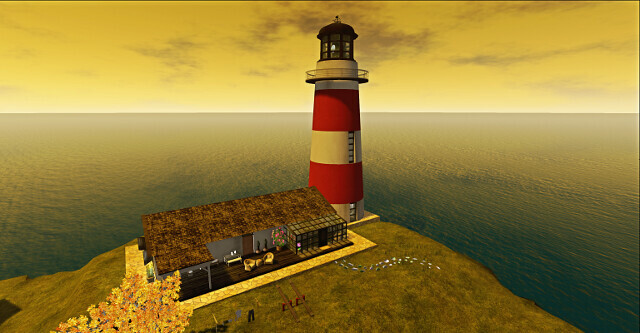 This blog will be dedicated to my experiences in the virtual world of Second Life. Not all of my experiences there – it has to be said: I do not intend to make it too personal. Nevertheless, being 5 years old in SL gives me some experience as an explorer of such an amazing universe of creativity. Of course, I still have a lot to learn, because SL is always changing and the inventiveness of its residents is infinite. This is, after all, what makes this journey worth it. So this is what this blog is about: the marvel of people’s ingeniousness in a virtual world. I will be traveling up and down, taking virtual photos and searching for wonders. I am particularly interested in how we can expand our boundaries in SL, in how we can give some “reality”, including some “physics”, to things we envisage but that would be difficult or even impossible to bring to the atomic world. It does not mean that I will only pay attention to what is “not possible in real life” (although it is possible that not-possible-in-real-life things become the major subject of this blog). I do not intend to be a second Bettina Tizzy. The work she did for publicizing architecture, landscaping and art elements in SL that would not be possible in real life was amazing and will always be remembered – but I do not have her knowledge, her expertise nor her talent. I will just visit different sims, go exploring and try to share, both via photos and text, my experience, my thoughts while in those places. My starting point is, nonetheless, a very conventional place. My house in Saint Niguel Isle, in SL, is very “possible” in”real life” (I know this expression has a lot of possible interpretations and that there are considerable objections to it, but I will keep using it for now – and maybe some time I can come back to this point again). Because of that, though, it is also a good place from which to start this journey. From there, I can let myself get surprised at any new wonder I find or at any already-seen marvel i revisit along my way. There, I can also find a safe harbor to dock at and not run the risk of being haunted by any form of the Stendhal syndrome. My house is beautiful – to me, at least. It gives me peace and joy, makes me feel at home. It is a lighthouse – and it certainly helps me find myself when I am on dark seas. And here I share it with the ones who read this post, in three different photos, under three different light conditions. From there I will seek fascination, astonishment, surprise and amazement. To there I will always go back and rest. Let this journey begin! PS: If you would like to suggest places in SL that I could visit, please, go ahead.